Much of the lead-up to season two hinged around whether or not Sabrina would reconcile with her mortal high school sweetheart, Harvey (Ross Lynch), or move on with Nick, who attends the Academy of the Unseen Arts with her. Though she and Harvey briefly rekindle things in the beginning of the season (emphasis on briefly), Sabrina quickly comes to realize that the differences between them are too vast - although they once loved each other, her magic has driven a wedge between them whether they want to admit it or not. 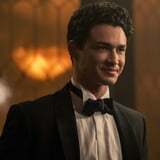 Overall their split ends up being for the best: Harvey moves on to a romance with Sabrina's BFF, Ros (Jaz Sinclair), who actually ends up being a far better fit with him, leaving Sabrina free to pursue a relationship with Nick. He's clearly smitten with her from the get-go, and consistently supports her through all the ups and downs she experiences now that she's signed the Dark Lord's book and enrolled full-time at the Academy. From making sure Sabrina feels safe and secure when the students are forced to participate in a lusty tradition that she's not quite ready for, to helping her prep for a competition to be Father Blackwood's "top boy," Nick is there for her no matter what. That's what makes his eventual betrayal of Sabrina cut so deep. As we discover in the last episode of season two, "Chapter Twenty: The Mephisto Waltz," Sabrina's father isn't actually Edward Spellman. Apparently Edward and his human wife, Diana, were having trouble conceiving, so they allowed the Dark Lord to step in help out. So, as Aunt Hilda (Lucy Davis) fills Sabrina, Ambrose (Chance Perdomo), and Aunt Zelda (Miranda Otto) in during a shocking conversation, Sabrina is actually the daughter of Satan himself. That's why Sabrina has been able to exhibit unfettered power far beyond that of her peers, aunts, and even Father Blackwood, and also why she's listed as part of an ancient prophecy that foretells the coming of the apocalypse. Satan ends up arriving in Greendale in his "fallen angel" form (aka a hot, shirtless British dude) and demands that Sabrina join him as his daughter/queen (sure, not weird at all). When she refuses, he baits her with a number of revelations, including that he was the one who told Nick to get close to her; their relationship was actually a sham. Sabrina is rightly furious, but Nick desperately tries to explain that although the Dark Lord asked him to influence Sabrina and keep her on the path of night, his feelings for her are real. That's why he decides to put his money where his mouth is and make the ultimate sacrifice. In order to get rid of Satan, Sabrina, Nick, Miss Wardwell, and her family conspire to imprison him in the demon-trapping device that Edward Spellman created years earlier (the same one they use to trap the sleep demon Batibat in season one). It briefly works, but he's able to burst out seconds later in a puff of red smoke. Miss Wardwell (aka Lillith) informs the group that the only thing that can actually hold him is a human body, so Nick instantly volunteers to bind the Dark Lord to himself, trapping him permanently. Even though Sabrina protests, Nick goes through with the spell and is (tragically) successful. Ambrose hits him with a sleeping spell to knock him out as they try to figure out what to do next. In the end, Miss Wardwell tells them that there's only one answer: she will reign as Queen of Hell, and will take Nick with her so that the Dark Lord can't escape into the mortal world. Sabrina tearfully says goodbye as Nick, still asleep, is carried by Lillith into the fiery realm beyond the Gates of Hell in the Greendale mines. "Let's go to hell and get my boyfriend back." So, is Nick gone for good? Does the fact he's in hell mean that he's technically dead? The final scene of the season sees Sabrina sitting down with Theo, Harvey, and Ros to reflect on what happened. Even though the situation seems dire, she convinces them that they need to "work together against the forces of darkness" now that everyone is up to speed on her supernatural double life. "It might be impossible, and it might get us killed," she says of their impending mission. "Let's go to hell and get my boyfriend back." Since we already know the show is coming back for a third season (and a fourth! ), we can guess that Sabrina will follow through with her plan to bring Nick back, or at least attempt to. Her incredibly strong powers combined with Ros's visions, Theo's special help from his ancestors, and Harvey's . . . uh . . . bravery (?) will hopefully be enough to rescue Nick. Will he come back changed? Something tells us taking a vacation to hell isn't exactly a picnic. And also, will Lillith help them figure out a way to release the Dark Lord from Nick's body and trap him somewhere else? A premiere date for season three has yet to be announced, but we can likely expect it to drop in Spring 2020. So, in other words, we have plenty of time to come up with a few theories.